The ADL, an old liar, is pushing a new lie. The Honorable Minister Louis Farrakhan has never “admired,” “supported,” “endorsed,” or “commended” GOP presidential hopeful Donald Trump, despite reports from Politico.com, News One, U.S. News & World Report, WHIO, Tablet Magazine, The Fiscal Times, The Hill, Gawker, Forward, Newsmax, The Inquisitr, Root.com, Grio.com or any one of a number of so-called news organizations spreading this false narrative. In outright lies, these articles seek to portray the Minister as a supporter of the man who has shaken the Republican establishment and freed White Republican voters, who flock to his banner, from any notion of political correctness. They fully embrace his often racist and demeaning diatribes. Since the root of the problem is the ADL, twisting the truth and a lapdog media response are unsurprising. Consider this: If Satan was representing God to you, what would God look like? The beginning of the media deluge was essentially a piece on Politico.com headlined: “Louis Farrakhan praises Donald Trump.” “Nation of Islam leader Louis Farrakhan praised Republican front-runner Donald Trump for refusing donations from Jewish groups,” Politico.com said online March 1. At least Politico was honest enough in its report to include a link to ADL anti-Farrakhan-anti-Nation-of-Islam-propaganda and cite the ADL as the source. Some later incarnations of the story dropped the ADL reference altogether. In journalism, the source of information is just as important as the story as the source shapes, verifies, discredits, clarifies or provides information about the subject of the story. A basic question for anyone with a basic understanding of what journalism should be: What is the motivation of the source, how credible is the source and what is the interest that the source has in the story? The less personal involvement or personal connection the source has to the story, the stronger the testimony, if you will, from the source becomes. The stronger the personal connection or personal interest in relation to the story, the more suspect the testimony and the greater the need to verify and corroborate what the source says. 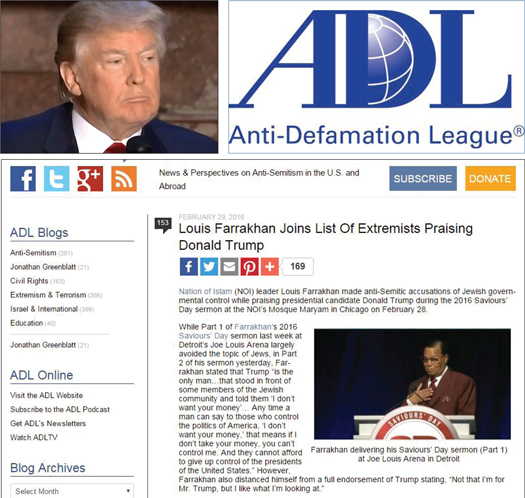 The ADL hates Louis Farrakhan and hates the Nation of Islam. How can this group, which has spied on and targeted Black leaders and groups and backed the death of affirmative action, be seen as pro-Black, neutral or truthful? It can’t. Another basic tenet of journalism? Go to the original source. None of these so-called stories go back to the original source cited by the ADL, which was a major speech Feb. 28 at Mosque Maryam in Chicago, “Divine Instructions: Commands For 2016, Part 2.” The message was a powerful follow-up to the Minister’s annual Saviours’ Day address delivered the previous week in Detroit. And despite a national press release, and another 500 outlets invited separately to attend or cover the speech in Chicago, not one media outlet showed up. Not one media outlet wrote about the speech itself, which was about three hours and available online. Anyone who wanted to tell the truth and anyone with respect for journalism could have at least gone back to some of the webcast to hear exactly what was said. Perhaps in this day of instant journalism and borrow-from-here-repeat-from-there-unoriginal-reporting following any kind of ethical behavior has been discarded. Or maybe this is another example of the power of America’s Zionist forces to shape and create media coverage and produce slanted reporting. These false reports try to paint the Minister as obsessed with Jews and their power, when actually the opposite is true. The ADL and its Zionist cronies have tried to destroy the Minister and the Nation since 1984 when the Minister defended Rev. Jackson, who referred to Jewish power in New York as “Hymietown” in an off the record conversation with Black writer Milton Coleman of the Washington Post. Mr. Coleman turned the information over to a White colleague. “Ruin Jesse Ruin!” and death threats followed from the Jewish side after a Post article was published. Min. Farrakhan called for cooler rhetoric but warned harming Rev. Jackson would not be tolerated. At Mosque Maryam, the Minister repeated some observations about the Trump Political Phenomenon and noted the candidate’s lack of dependence on outside money potentially frees him from the grip of special interests. While the Zionists were mentioned in this context, as the Minister talked about the Middle East and those plotting against Muslim nations and Islam, his observations have been consistent, noting that if Big Money does not control Mr. Trump, he may be freer to act. Act how? Act in ways that deal with the problem of Black and White and the need for Blacks to have a separate state or territory of our own. It doesn’t matter if Negroes agree or disagree. It doesn’t matter if Black political leaders shilling for the next White Political Messiah accept it as realistic—this is the Minister’s position and the position of the Nation of Islam. Take it or let it alone. The Minister also said, again, none of the candidates running for office are worthy of the Black vote at this point—and none can be trusted to fulfill their promises. None would undoubtedly include Mr. Trump. The Minister noted that Mr. Trump told the Israel First lobby in America he did not want nor need their money, which means they cannot control him. He then recited some of the history of candidate Hillary Clinton: Her role in the destruction of Libya and killing of Muammar Gadhafi. Her calling Black youth “super-predators” in 1996. And I would add her condemnation of Min. Farrakhan and pushing candidate Obama to denounce the Minister in 2008. “I don’t blame you for wanting a female president, but that is a wicked woman,” said Min. Farrakhan. He pointed out that words, records and actions matter. “Mass incarceration came about under the Clintons—don’t forget that. They called my young gang bangers super-predators and Black Lives Matter put it to her, and she didn’t know how to handle that. Called you a super-predator, that has no conscience, no sensitivity like you’re a dog, or you’re an animal. Got to bring you to heel my young brothers! This is what she said about you! And she didn’t just say it—it became law and policy of the U.S. government under Bill Clinton and his wife, and now she is apologizing, but apologizing can’t bring back the broken families. Apologizing can’t bring back those that have been destroyed in prison life,” he added. Hmmm. I wonder why that didn’t get much play in the media? Minister Farrakhan said Vermont political leader Bernie Sanders, running opposite Ms. Clinton for the Democratic nomination is trying to be decent and is a true Jew. Yet no one reported that, guess it didn’t fit the ADL script. The Republicans are no better, said the Minister. Neither Mr. Trump, nor any candidate, can solve America’s problems unless they deal with the problem of justice for Black people in America, he said. Watch the weather because more calamities will strike as God punishes America for her evil done to Black people, Min. Farrakhan added. Hmmm, that got lost in translation too? Don’t be mad at Farrakhan or twist his words. Try being bold enough to tell the truth and see what happens, that’s what real journalists would do. Richard B. Muhammad is editor in chief of The Final Call newspaper. He can be reached through www.finalcall.com and at editor@finalcall.com. Find him on Facebook at Richard B. Muhammad and on Twitter:@Rmfinalcall. His website is www.richardmuhammad.com. Catch his weekly segment Sundays at 8 a.m. CST on touchfm.org.